Around 15% of Americans have hearing loss caused by loud noise − and it’s completely preventable. Find out how much exposure to loud noise is too much, and things you can do to protect yourself. ​Most sound we encounter every day is at a safe level. Sometimes, however, we are exposed to sound that is too loud which can damage our hearing. This type of damage is called noise-induced hearing loss (NIHL). Noise-induced hearing loss can affect one ear or both, can be temporary or permanent, can occur immediately or take awhile to set in, and can cause tinnitus (ringing or buzzing in the ears). The general rule is the louder the sound, the less time it takes to cause damage. Noise can start to cause damage at 85 dB when exposed for 8 hours or longer. According to the Occupational Safety and Health Administration ( i.e. OSHA), for every 5 dB increase in volume, the time of exposure should be decreased by half in order to avoid damage to your hearing. For example, with exposure to 90 dB, hearing damage will occur within 4 hours. However, once the volume gets above 100 dB, exposure time should be less than 15 minutes. Anyone can be affected by NIHL. 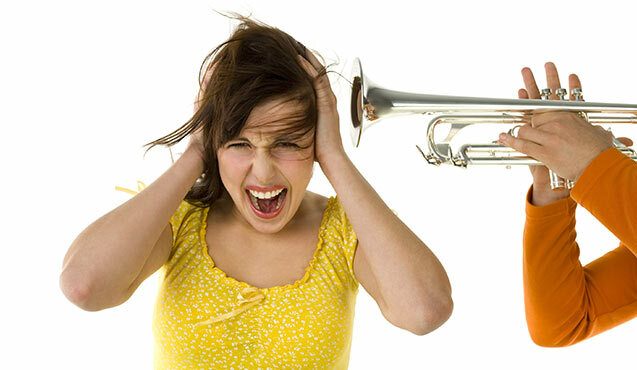 Roughly 15% of Americans have hearing loss caused by loud noise. The rise of teenagers with NIHL is also increasing drastically due to prolonged exposure to loud music and hobbies. The best way to prevent noise-induced hearing loss is to wear hearing protection, or move away if the sound is too loud or too close. If you have ringing or buzzing in your ears (tinnitus), or suspect you may have some hearing loss, visit an audiologist to get a hearing test. An audiologist can also provide you with custom hearing protection devices for a variety of activities, including music, hunting, loud work, etc. ​National Institute of Health. (2015). Noise-induced hearing loss. <http://www.industrialnoisecontrol.com/comparative-noise-examples.htm>. IAC Acoustics. (2016). Comparative examples of noise levels. <https://www.nidcd.nih.gov/health/noise-induced-hearing-loss>. Occupational Safety and Health Administration. Occupational noise exposure. <https://www.osha.gov/SLTC/noisehearingconservation/>.